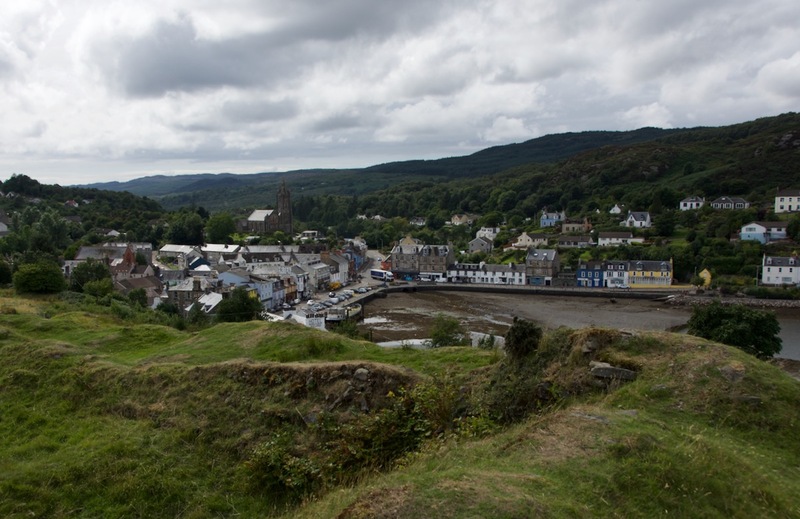 We took a little jaunt down to Tarbert the other day – a small harbour town, about 13 miles south of Lochgilphead. So pretty and peaceful! But this has been an important place in Scottish history. Magnus also wanted Kintyre, which is technically a peninsula, but that wasn’t going to stop him. He ordered his men to haul a boat from shore to shore across the narrow neck of land at Tarbert, about a mile in distance, while he sat at the helm. Having proved it to be “navigable”, he lost no time in laying claim to Kintyre, which he thought was “better than the best island of the Sudreyjar [Southern Isles], Man excepted.” (Orkneyinga Saga). As we looked down at Tarbert from the castle ramparts, I imagined Magnus being carried up the beach and overland, sitting proudly in command of his boat while his crew hauled in unison and maybe sang battle songs. The name ‘Tarbert’ crops up in several other places across Scotland, in various spellings. The Gaelic ‘An Tairbeart‘ literally means ‘across-carrying’ or ‘portage’. It was strengthened by Robert the Bruce in the early 1300s, to defend it against the MacDonald Lords of the Isles, who eventually succeeded in re-capturing it. 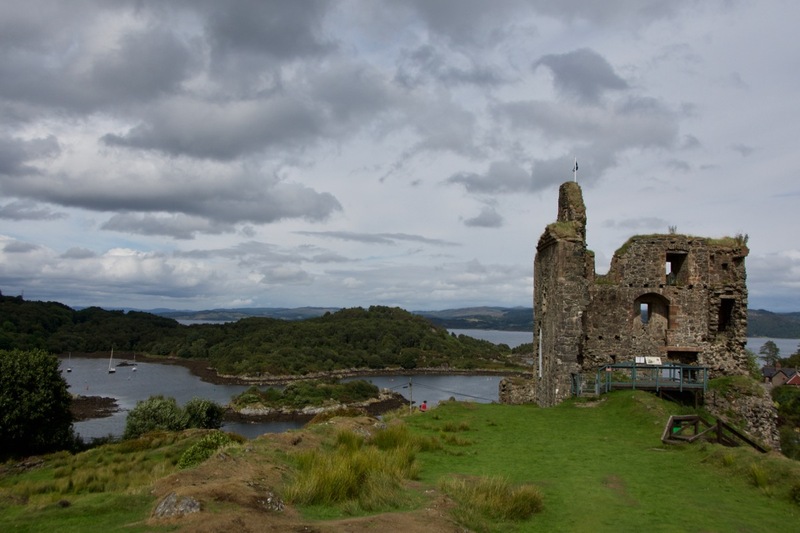 In 1494, James IV embarked on a determined campaign to squash the Lords of the Isles once and for all; he seized Tarbert Castle, built the tower, and installed a garrison here. Thereafter it passed between MacAlisters, MacLeans and Campbells until it was abandoned in the late 18th century; stone from the ruins was used to build the harbour and houses in the town. 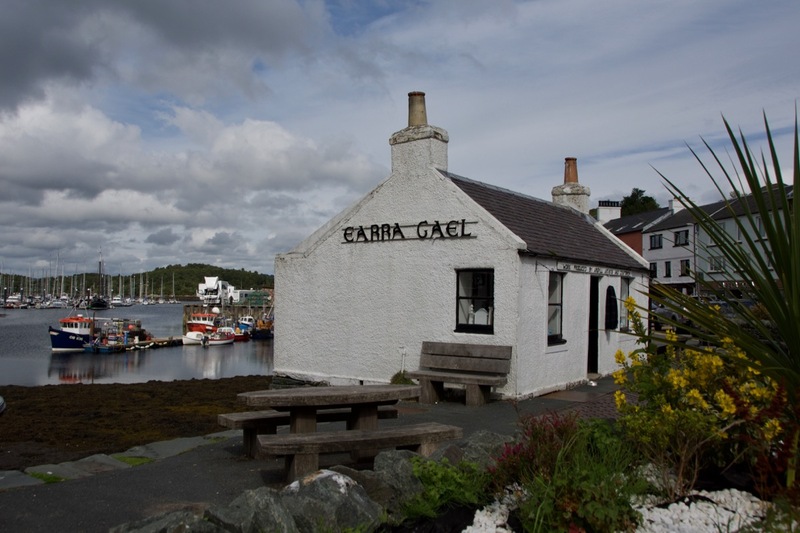 The Earra Gael gift shop has been a feature on Tarbert’s harbour ever since we’ve been coming here, and that’s quite a long time! It is a former weighbridge office, dating from the 19th century. Vehicles would drive onto the big metal weighing plate (just visible outside the door) to be weighed and then loaded from the harbour. Once fully loaded, the difference in weight would be calculated. I love the idea of a Viking crew using it to weigh their cargo of Magnus Barefoot, but of course that never happened! Footnote: Magnus Barefoot (Magnus III of Norway) is also known variously as Barelegs, Barlag and Berrfott. It is said that he acquired this nickname through his preference for the tunic worn by the Gaels, which left the lower legs bare. He was also known as ‘Magnus the Strife-lover’. I know, David – we can’t stop the change! But Tarbert has so much going for it, as you say. We love the Crinan Canal too, and there are some lovely places and beaches south of Tarbert – Skipness, for example, and I really want to get down to Saddell Abbey. We spent a memorable New Year at nearby Stonefield Castle, and should have made more time to explore. Fascinating article from you – as ever. Don’t you just love those old Norse and Danish names? Two of my personal favourites are Ivar the Boneless and Ragnar Hairybreeks (or something). Thank you! That sounds a great way to spend New Year! I do love the old Norse names! I think they must have made them up specially so they sounded good in the sagas! Hadn’t heard of Ragnar Hairybreeks but obviously he cared very little about personal comfort! Very interesting story! Magnus would have been a fascinating man to know. Yes, he would! It was a brutal time but there was still some kind of honour and it would be interesting to understand more about what motivated them. And their gods and mythology – that’s fascinating as well!